The Mississippi Blues Project is up and running! 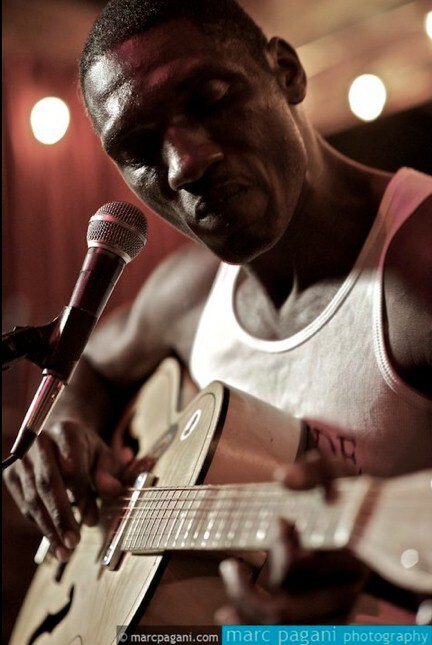 The “big bang” on Sunday afternoon August 20th featured the Cedric Burnside Project and Big George Brock in a stunning, earth-shaking concert in a large tent stage at the Philadelphia Folk Festival. The Cedric Burnside Project, a two-man outfit featuring Cedric Burnside on drums and Trenton Ayers on guitar, put down what might be called a “gold-medal” performance of modern Mississippi blues. Burnside’s awe-inspiring skills on the drums, and the artistry and athleticism of his playing no doubt left vivid memories in the minds of the many people crowding up to the stage, dancing, hollering, clapping hands, and perhaps wondering, as I was at times, how this was humanly possible. At times his sticks hit the cymbals in such a rapid-fire fashion that, from where I sat, some sort of optical illusion was occurring and it looked like the sticks were “eating” the cymbals as they flashed downward. 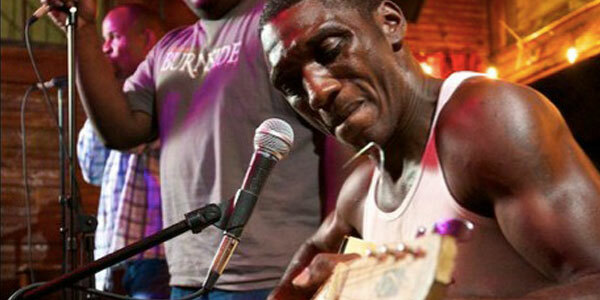 Cedric Burnside is the grandson of the unforgettable R. L. Burnside. Their relationship was very close, and Cedric often echoes his grandfather’s sound and style, especially when he says “Well, well, well” between songs – – which at this point is a Burnside signature element, with the vowel in “well” halfway between “well” and “whale.” The music is rooted in tradition but also fully contemporary both in topics and style, incorporating elements of hip-hop. Guitarist Trenton Ayers was a dazzler, and I wish I’d had a chance to talk to him about his style. At one point between songs he strummed his guitar, and it sounded out-of-tune to me. He didn’t tune much, though, and when he went into the next song he got exactly the notes he wanted. Using a slide and bending strings, I suspect that Ayers in some ways plays the guitar the way a violinist or cellist plays. They don’t have frets on their instruments, and they know how to find the exact note they want without them. A second guitar sat in a stand for the entire set. This was Cedric’s guitar. He plays in a simple but distinctive hill country style, and the only thing I could say that was missing in this inspiring show was that he did not walk over to his guitar and play a song or two on it. I suspect that he felt that the energy rising from his drums in the music they were playing was too compelling to modulate on-the-fly that afternoon. Of course that means we’ve got to get him back here again sometime! Following the Cedric Burnside Project’s set would be a daunting challenge for any performer of any kind of music, but 80-year-old Big George Brock seemed up to the task. Brock is almost blind at this point, and has some hearing loss and problems with his hands, but none of that prevented him from singing the blues the way only an authentic blues singer can, and playing his harmonica with aplomb. Brock was regally attired in robes, with a cape and crown, and his band was top-notch. 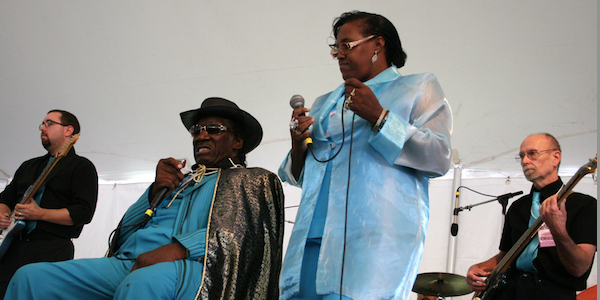 He also brought with him singer Clarine Wagner, making her first appearance in this part of the country (Brock appeared some years ago at the Pocono Blues Festival). She warmed up the tent with “So Many Times” and the popular standard “Let The Good Times Roll.” Her appearance on Brock’s latest album “I Got To Keep My Bedroom Door Locked” is also her recording debut. Brock’s wonderful sense of humor comes through on the title track of this album, which he performed in the middle of his set. The mere name of the Magnolia State can still evoke vivid and often frightening memories. The brutality of slavery in Mississippi was followed by the hopelessly unfair system of sharecropping, in which many black farmers were perpetually in debt and unable to get paid fairly for their crops. Many of the most memorable and horrifying events of the civil rights movement took place in Mississippi — the murder of three young civil rights workers and its cover-up, the assassination of NAACP Field Secretary Medgar Evers, the shooting of James Meredith on a one-man “March Against Fear” from Memphis to Jackson. For some players, music offered extra income, and for a few, such as Charley Patton, an escape from doing farm work. Yet for many, a physical escape from Mississippi was the only answer. Blacks left the state in large numbers for many places, primarily Memphis and St. Louis in the south, and Chicago and Detroit in the north. The rural “Delta Blues” was electrified in the postwar years, and artists such as Muddy Waters, Howlin’ Wolf, Jimmy Reed, and B. B. King (who never really had a “Delta” sound) established their careers and left cotton picking far behind them. The blues also continued to thrive in the Delta, in the fields and the juke joints, as well as the “hill country” outside of the Delta, where Mississippi Fred McDowell influenced a generation of blues players with a more repetitive and trance-inducing sound than the blues of the Delta. Among the artists who would become well-known for this style are R. L. Burnside and Junior Kimbrough. The juke joint scene in both the Delta and the hill country was musically rich, though the clubs, as described in Bill Coday’s song “Country Back Hills Juke Joint,” could be pretty rough-and-tumble places. There were good reasons why some clubs were called “a bucket of blood” club. As the clientele for the joints aged, the violence diminished and a growing tourist industry became significant to their operation and the proliferation of the music. Sadly, in this century, the juke joint scene has been in substantial decline as casinos have arisen in Mississippi, and small club owners have chosen to hire deejays more often than live bands. Clearly, though, this is a time of transition, and what the old players can bring to us of the magic of Mississippi blues, the elusive grasp of pitch, texture, tone, and timing that is far more important than mere technical virtuosity in the blues, and the transcendent spirit of the music, is something of priceless value. 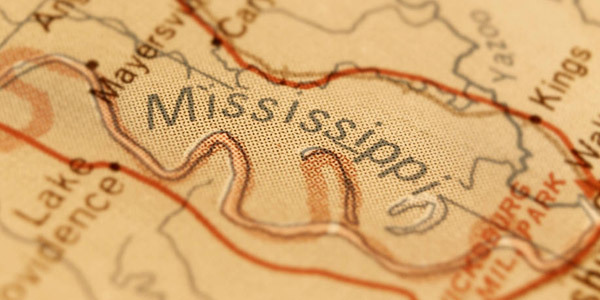 The state of Mississippi and its local communities have recognized the great cultural treasure that grew there, even though recognizing and celebrating it necessitates acknowledging the horrors that gave rise to it. With reverence for the trailblazers of the past and an eye on the future, they have established the Mississippi Blues Trail with markers throughout the state. The Delta Blues Museum in Clarksdale and the B.B. King Museum and Delta Interpretive Center in Indianola present the Mississippi blues and its story as well, a story of music and human understanding unparalleled in cultural history. Guitar is Big A’s main instrument, though he plays bass, drums, and keyboards as well. Big A and his band were regulars at Sarah’s Kitchen, one of the area’s major blues venues until proprietor Sarah Moore was killed in an auto crash, and the restaurant went out of business. He has played at numerous other clubs and events in the Delta area. 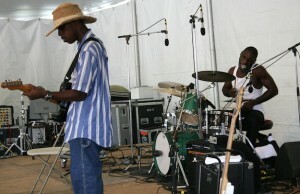 Recordings of Big A are few; he appears on bass with Alvin “Youngblood” Hart and the late, great drummer Sam Carr on a song called “Joe Friday” in the 2003 film “Last Of The Mississippi Jukes.” Alvin Youngblood Hart notes in his intro that Sherrod has been playing blues in the area from a very young age. 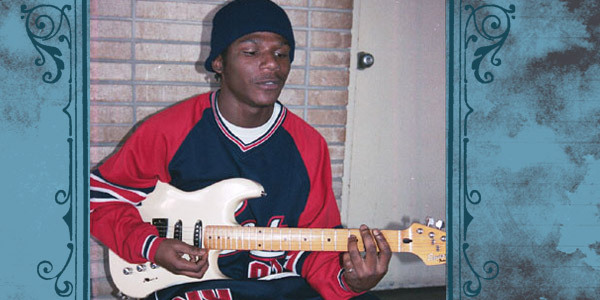 Sherrod is also featured in the 2012 film “We Juke Up In Here,” now as the band leader. He offers a spirited performance of a song called “Call Me A Lover” in the best tradition of male boasting (along with a bit of humor), and he also wrote and plays the title track for the film. Big A is an exciting performer who freely moves around a performance space with some fancy footwork. In videos posted online, Sherrod can be seen playing around Clarksdale, including a spirited, bluesified version of a children’s song “Patty Cake Patty Cake,” obviously pleasing his audiences and deriving pleasure from performing.